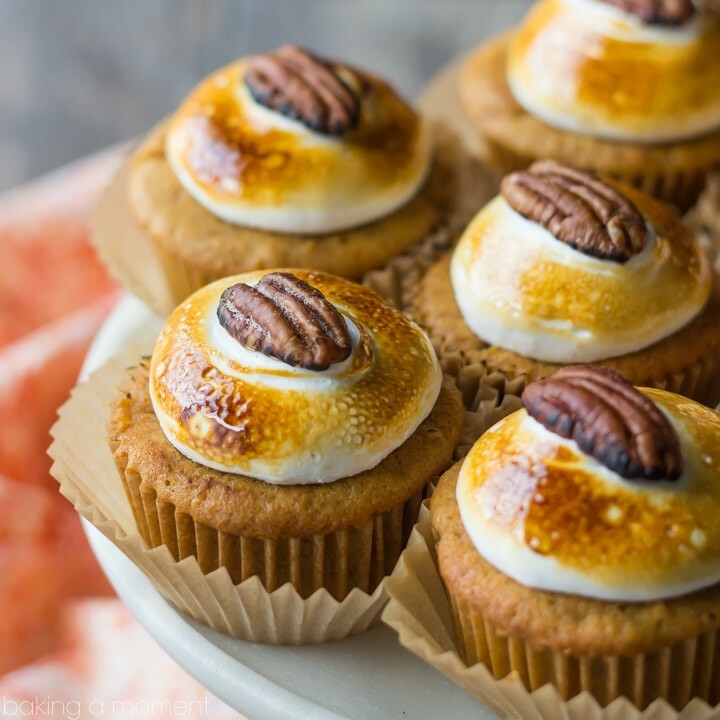 These moist and fluffy cupcakes are inspired by everyone’s favorite Thanksgiving side dish- the sweet potato souffle! With a touch of pineapple and cinnamon, and a toasted marshmallow and pecan topping, it’s just like grandma’s casserole in dessert form! If you need a fun & unique treat to serve this holiday, look no further than this easy, one-bowl recipe. Up until a few years ago, I refused to touch a sweet potato. Crazy, right? I know. But back in the day, sweet potatoes were dumped from a can and buried in brown sugar and butter. Normally I am ALL for brown sugar and butter, but somehow it just never worked for me when it was coating a slippery soft sweet potato. Then I discovered sweet potatoes paired with savory and spice, and it was like a whole new world opened up. I love them now, with sharp cheese and chorizo, or when combined with peanut and chilis, or smoky chipotles… I just can’t get enough. So much so, that when I first met my husband’s grandmother, and she was toting a big earthenware dish of her famous sweet potato souffle, of course I was game to try! Even though her sweet potato casserole is sweet, I still loved it! She folds a little crushed pineapple into the mashed sweet potatoes, and it provides such a nice balance. And the toasty marshmallow topping is pure heaven. I always help myself to a big dollop, and I save it for the last bite of my Thanksgiving meal. It’s almost like dessert on your dinner plate! But then, of course, there’s dessert-dessert, and no shortage of it, at that. So this year I thought, why not take my favorite sweet dinner side dish and give it its proper due as an actual dessert. These fun cupcakes are perfect to bring to your family feast or friends-giving. The moist, fluffy cake is full of gently spiced sweet potatoes, and the marshmallow frosting is SO much fun. I used a brulee torch to toast it up, but you could also stick them under the broiler for a few minutes (that’s what Grandmom does), for the same effect. Just be careful not to set the cupcake papers on fire! And don’t forget to top it with a pecan half! It looks so pretty, and that little bit of salt and crunch really works with all the soft and sweet. I hope you’ll give this recipe a try! 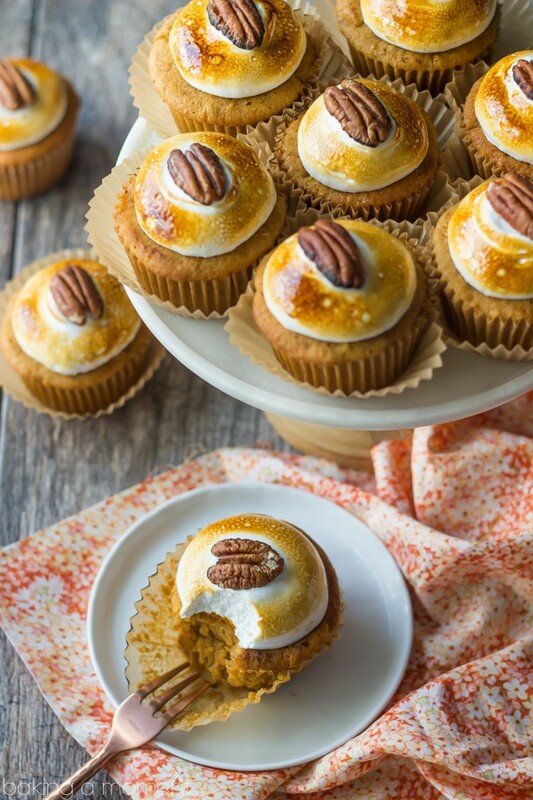 These moist and fluffy cupcakes are inspired by everyone's favorite Thanksgiving side dish- the sweet potato souffle! With a touch of pineapple and cinnamon, and a toasted marshmallow and pecan topping, it's just like grandma's casserole in dessert form! If you need a fun & unique treat to serve this holiday, look no further than this easy, one-bowl recipe. Preheat the oven to 350 degrees F and line cupcake pans with papers. Place the flour, brown sugar, baking powder, baking soda, cinnamon, and salt in a large mixing bowl and whisk to combine. Add the butter, and mix on medium speed until the mixture resembles damp sand. Add the eggs, one at a time, scraping the bottom and sides of the bowl after each addition. Add the mashed sweet potato, pineapple, and vanilla, and beat on medium high speed for about a minute to a minute and a half, to aerate the batter and build the cake's structure. Fill the cupcake papers about 2/3 full, and bake for 22-24 minutes, or until a tester inserted in the thickest part of the cake comes out clean. Place half the water in a large mixing bowl, and sprinkle the gelatin on top. Set aside. Place the remaining water in a medium pot, along with the sugar, corn syrup, and salt. Cook on medium heat, swirling the pot occasionally, until the mixture registers 240 degrees F on a candy thermometer. Carefully pour the hot syrup over the reserved water/gelatin mixture. Using a whisk attachment, whip the mixture on low speed until slightly thickened. Increase the speed to high and whip until thick, glossy, and white. Stir in the vanilla. Top the cooled cupcakes with the marshmallow topping (I used a piping bag with no tip), press a pecan half in the center, and brulee with a torch or under the broiler. Prick the sweet potatoes with a fork, wrap them in foil, and roast for 60-90 minutes in a 425 degree oven. Cool slightly, cut in half lengthwise, and scoop out the soft flesh. This can be done up to a few days ahead. Allie, these cupcakes are gorgeous!!!! I so need a brulee torch!!!! and absolutely love the sweet potato! The brulee torch is SO much fun. You need it! Thanks Alice! Adorable! That’s all I can say. What sweet cupcakes faces. Sweet potatoes are an old friend of mine. LOVE them. Definitely will adorn with a pecan half ~ so lovely. Yay! I’m so happy you like these. Thanks so much for the sweet comment! ALLIE THAT TOASTED MARSHMALLOW. I love you. These cupcakes look wonderful, Allie, especially that toasted marshmallow topping! And, yes, sweet potatoes paired with savory flavors are the best! These are incredible, Allie! 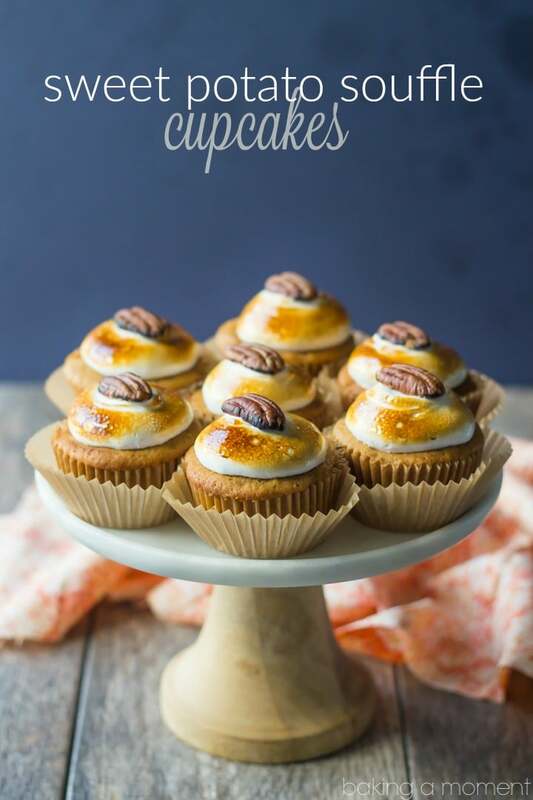 Sweet potato cupcakes is pure genius! I could eat them all!!!!! I LOVE these Allie!! And that topping!! Gorgeous! Thanks Mary Ann! Any excuse to break out the kitchen torch, hahaha! I’m so in love with these cupcakes. I love sweet potato with marshmallow and always look forward to it every Thanksgiving. These cupcakes, however, is my new favorite. Love this! I have to admit… I am still a little timid when it comes to sweet potatoes! 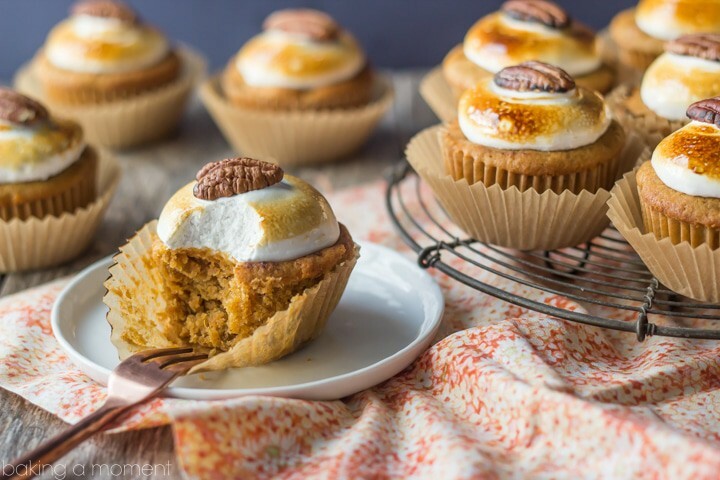 But Sweet Potato Souffle Cupcakes?! You are speaking my language! I thought I had seen everything, but these are brilliantly creative. I’m in charge of desserts at Thanksgiving and while I usually come up with my own thing, I am seriously considering making these. I just love them! These cupcakes are so gorgeous!! You were the first one to serve me sweet potatoes in a dessert and now I am hooked. I’ll just have to try these cupcakes on my own. Yay! That’s right- it was Jocelyn’s recipe! Which has now become a family favorite. So happy you like these Zainab- thank you! I want to make these cupcakes so badly but I’m very intimidated by the marshmallow topping! Any shortcuts or tips? Hey Wendy! I’m so glad you like the recipe! Please, please, don’t be intimidated. It’s really simple stuff. I know boiling sugar can seem scary but I promise this is so do-able! Do you have a thermometer? Just pop it in there and when it reaches temperature, dump it in the bowl with the gelatin. Start on a slow speed so it doesn’t splash, and then as it gets thicker you can increase the speed. I’ve done it a hundred times and it’s practically impossible to mess up. I hope you’ll give it a try; it’s such a proud moment when you step outside your comfort zone and come out with an amazing result. YOU CAN DO IT!!! Oh em gee. I would throw a pyrex pan of sweet potatoes against the wall to show my allegiance to these cupcakes. OK, that might be a bit dramatic. But so is my love for your creativity here! These are so beautiful! I really love the addition of the chopped pineapple that is such a great twist! Hi Alexandra! These cupcakes can sit out at room temperature for a few hours, but any longer than that, they should probably be chilled so that the topping doesn’t weep.